Summon: Put a random Atronach into your hand. High Rock Summoner is a rare Intelligence creature card. It is part of the Core Set. 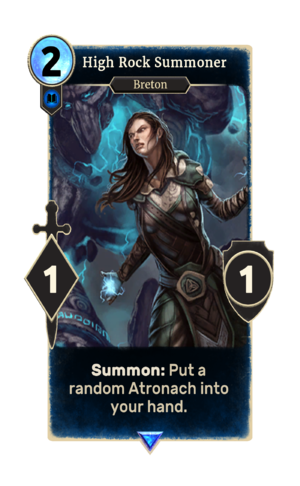 In addition to the card's availability in the Core Set, two copies are included in the Dagoth's Might theme deck, two copies in the Warriors of Hammerfell deck, and one copy in the Ancano's Cunning theme deck. "You've gotta go through HIM first." "My friend would like to say hello." The card is named for the nation of High Rock. This page was last modified on 15 February 2019, at 00:19.